Students play Jenga before the movie. Photo courtesy of Crystal Harrell. 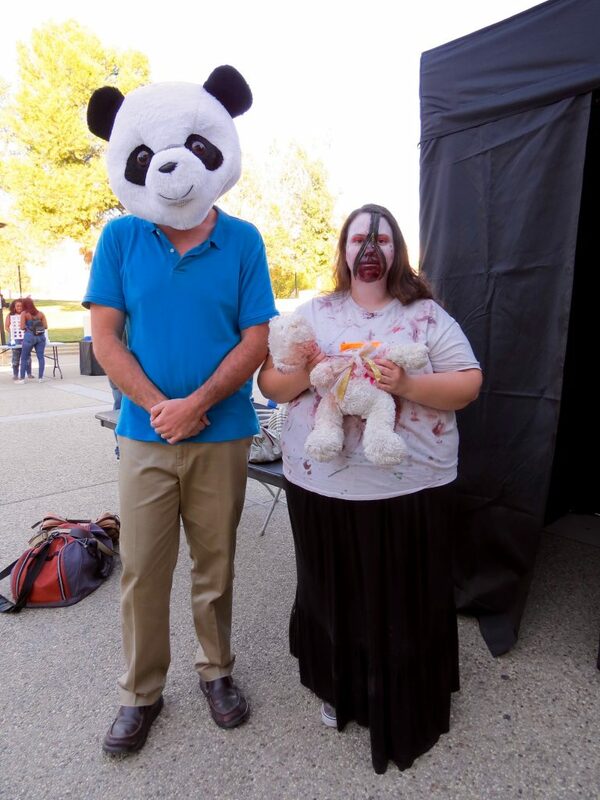 On Oct. 26, CSUSB’s Associated Students Incorporated (ASI) organized a Halloween Movie Night screening of Annabelle: Creation at the Lower Commons patio area. In addition to showing the movie about a supernaturally possessed doll, an assortment of other activities was also available for students to partake in. 4:30 p.m. is when the Halloween Movie Night officially began, while the actual movie screening started two hours later. 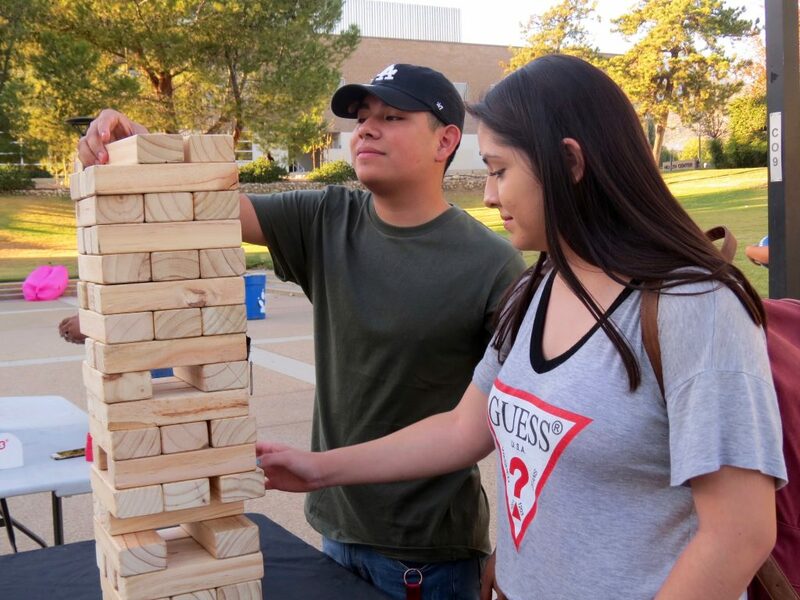 Before the showtime, attendees could get snow cones, play games like Jenga or Connect 4, and even take pictures in a photo booth with Annabelle herself. 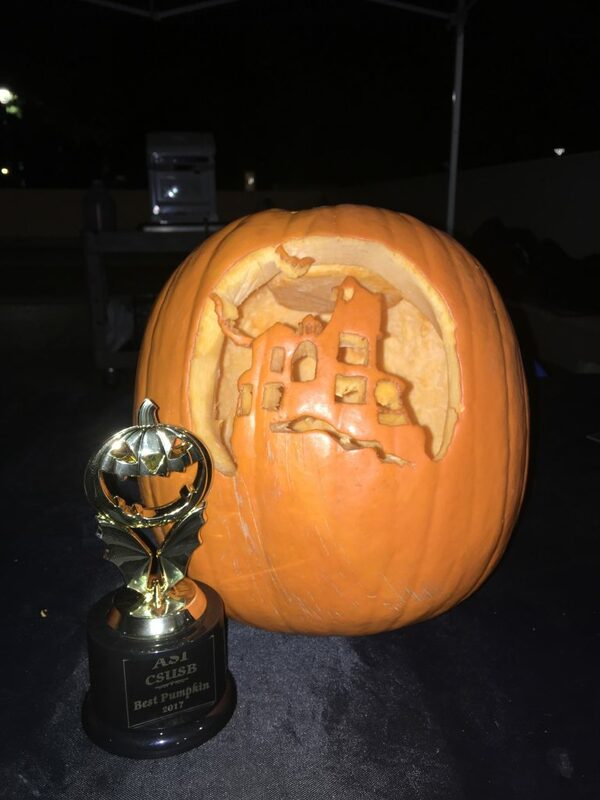 Pumpkin carving contest winner Alexis Ermels's haunted house design. Photo courtesy of Manuel Macias. stamp a piece of paper next to the carving they liked the most while the costume contest winner was decided after having participants parade around pageant-style and seeing who got the most applause from the audience. 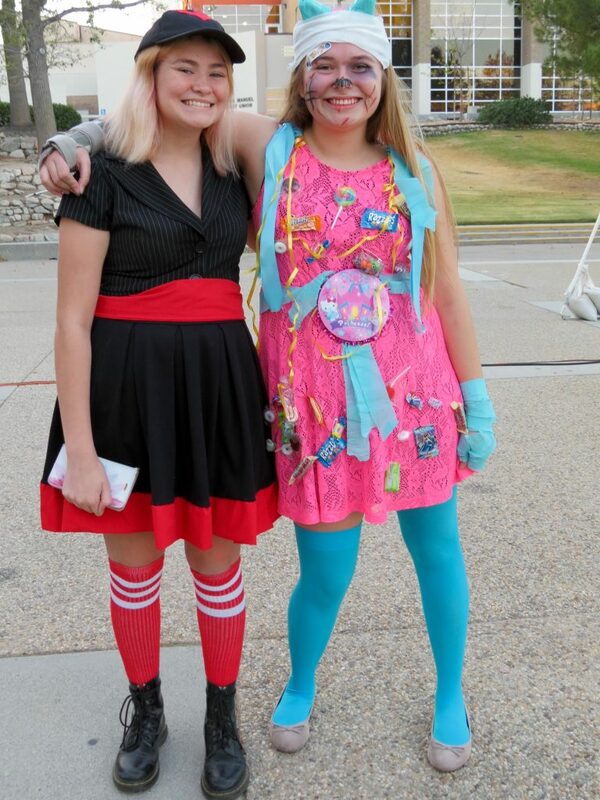 Anais Ford took home the trophy for Best Costume and two Six Flags tickets with her take on a beat up piñata. 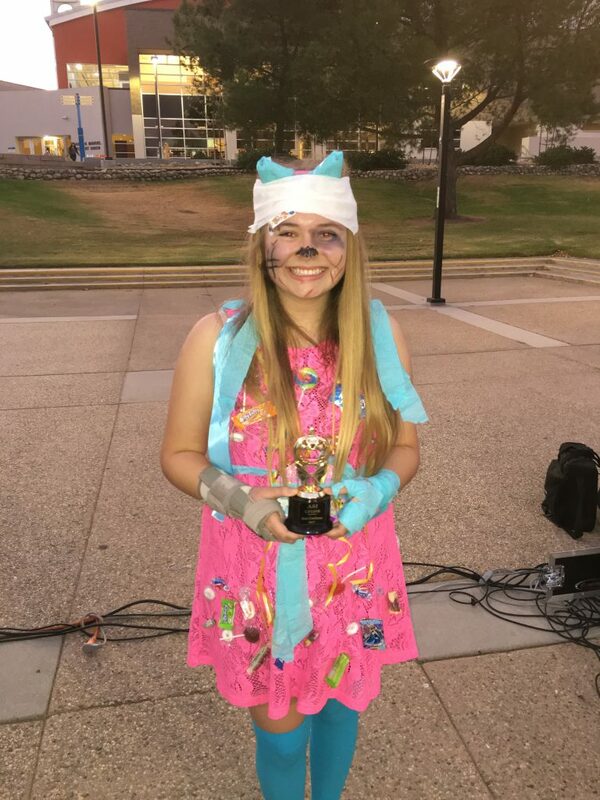 Alexis Ermels was given the prize for Best Pumpkin Carving for her haunted house design, and was also rewarded a trophy and a pizza party organized by ASI. Responsible for a wide array of on-campus activities and events, ASI serves on different organizational committees, provides programs and services to Coyotes, and offers representation at the state and national levels of student government. The Halloween Movie Night screening of Annabelle: Creation is not the first themed film showing held on campus. ASI was also in charge of the May the Fourth event earlier this year, complete with Star Wars-centered games and balloon light sabers following a screening of Rogue One on the Pfau Library Lawn. According to Programming Student Manager Manuel Macias, ASI conducted surveys to get student input on what kind of Halloween movie they would like to watch on campus. Macias believes that the Halloween Movie Night is a fun way for students to unwind from all the pressure they might experience during midterm exams week. “I think it’s important to have events like these so students can take a breather and have a moment to just hang out. This is a cool way to kick back and relieve that stress,” stated Macias. ASI already has more events lined up in the coming months for students to enjoy, but they are always open to suggestions and collaborating with other organizations. 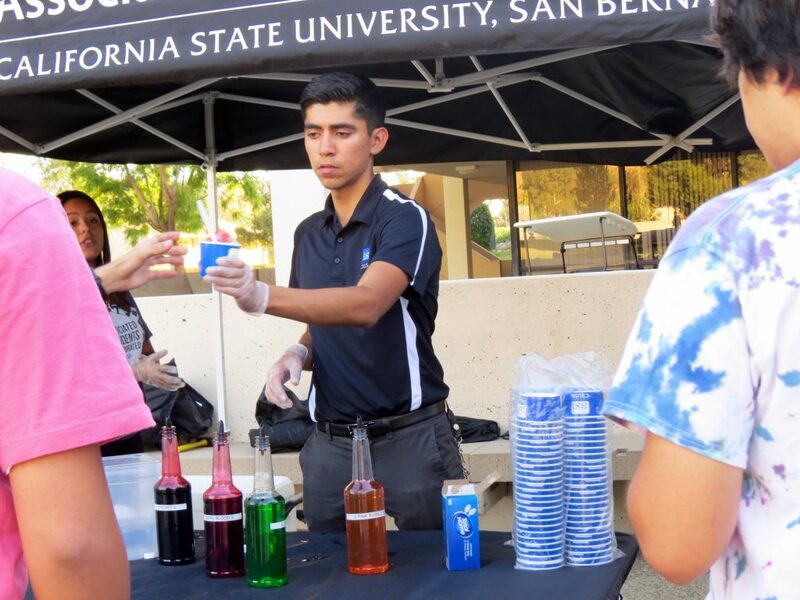 ASI also served snow cones during the event. Photo courtesy of Crystal Harrell. “Our motto is ‘for the students, by the students,’ so we try to do what’s best for everyone,” explained Macias.